Over 100 government representatives gathered on the 15th of September 2016 at The Hotel Realm, Canberra for the Australia OpenGov Leadership Forum. Mr. Mohit Sagar, Editor-in-chief at OpenGov started the day speaking about the importance of IT and its benefit realisation for governments, as well as focusing on the outcomes for citizens. More significantly, it is about making services available to citizens that is accessible, relevant and easy-to-use without necessarily incurring a high cost. Guest speaker Mr. Zaqy Mohamad, Chairman of Government, Parliamentary Committee for Communications & Information shared Singapore’s Smart Nation journey, explaining the context behind some of the initiatives being taken. Mr Mohamad shared two examples of driving visible outcomes within areas of focus, transport and healthcare. Ms. Marie Johnson, Head of Technology Authority, National Disability Insurance Agency, ACT and Mr. Gary Sterrenberg, CIO, Department of Human Services, ACT then came together on stage to give an insightful case study of leveraging on technology and innovation to improve service delivery through the National Disability Insurance Scheme (NDIS). Ms. Johnson shared with the audience a video of young man named Christopher with celebral palsy who, through the help of NDIS and interface technology, was able to make a meaningful living through video editing. The NDIS would cover over 460,000 Australians with disability and additionally another 2-3 million people who are the caregivers and families. Ms. Johnson added on how technology underpins and transforms a lot of the services delivered by the NDIS, challenging the existing paradigm of how people with disability can also contribute to society. 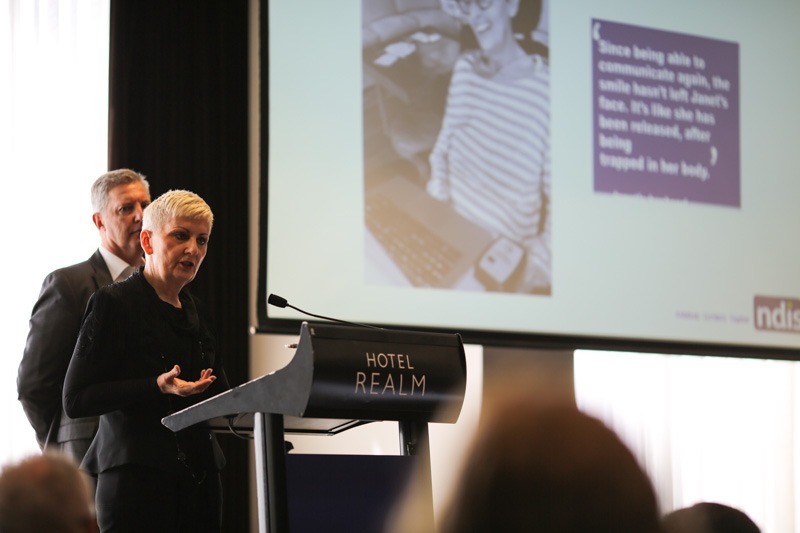 Another example was given of how a lady named Janet who was the first NDIS participant to receive a neural switch, which assisted her to communicate via the computer, to be able to use Skype and use text messages, email and use the Internet. Janet’s husband said that the technology improved her quality of life greatly, especially when she was receiving medical care and could not easily express herself. These examples demonstrated how technologies can act as an interface for people of disability and enable then to achieve social and economic participation. She summed up that innovation can happen in the most unexpected of places, through the examples of Christopher and Janet, prompting the audience to rethink how services can be delivered broadly across government. Mr. Sterrenberg (above) continued the session and raised the challenge of integrating many of the services and technologies provided by government to create a unified and coherent experience for the citizen end-user. Technologies can enable groups such as people of disability to connect and engage with the government. Government can provide the platforms and eco-systems for citizens to engage with them and also with each other. Subsequently, a keynote address was given by invited government speaker, Mr. Randall Brugeaud (above), CIO, Australian Department of Immigration & Border Protection (DIBP), ACT, about optimising many of the technology processes happening at the DIBP. Mr. Brugeaud began by stating that much of the business at the DIBP is heavily enabled by technology, such the automated smart gates at the airports which make it easier and faster for international visitors with biometric passports for departure/arrival processing. Mr. Brugeaud mentioned the need to support the increasingly mobile workforce and staff of the DIBP with better and richer information in their decision-making processes. 60% of all future project activity rely on technology enablement of some form at the DIBP, which is more than 100 million dollars investment over and above what the DIBP is spending on and this represents a huge investment with no room for failure. With challenges such as legacy infrastructure and imperfections in the operating model at the DIBP, Mr. Brugeaud spoke about how some of these issues were addressed: looking across the whole organisation, identifying fragmented IT processes and making more sensible decisions when integrating operations across different sub-organisations. A roadmap is in the process of being developed in terms of the technology strategy at the DIBP. The first panel during the second half of the event focused on the The Digitalisation of Government Services. Ms. Joanne Gray, A/g CIO, IP Australia, emphasised that it is not enough for government to just focus on services: both governments and private enterprise should partner together in sharing knowledge to deliver better services for the citizens. Security was also a topic that was raised during the first panel: Dr. Vladas Leonas, Former CIO, Sydney Motorway Corporation, NSW, felt that security is a complex issue to deal with and requires out of the box thinking that needs to be customised to different government agencies. Ms. Gray stated that security needs to be approached from the ground up but governments and agencies themselves have to ask which parts of their data need to be secure as it would simply be inefficient to secure everything without much thinking. The second panel on big data analytics for government raised an important key point: it is not so much about the data itself but about how looking at the data can help solve problems for agencies, provide better reporting and most importantly, provide the necessary information on actionable insights. Last but not least, the third panel on using collaborative technology to create the workplace of the future brought about several fundamental points: Peter Reichstadter, CIO, Austrian Parliament, reiterated that it was more important for collaborative work interfaces to be useable and relevant rather too overly high tech. It was also agreed that for the younger generations, having collaboration technologies and flexible work arrangements is a necessity, not an option.